“A tool that enables individuals to practice personal accountability by making better choices in the moment.” This is the definition of QBQ, or the Question Behind the Question. And John G. Miller’s book of the same name has sold more than a million copies.1 Why? 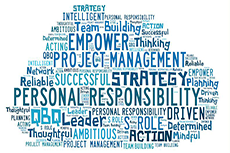 QBQ for organizational leaders encourages the leader to empower her team to ask the typical questions required of successful strategic planning, questions of mission, vision, target audience, customer segmentation and the programs and plans to implement the strategy. If your team is empowered, competent and well-trained, they should be handling these critical details. What are the top 2 or 3 things that must go right for this strategy to work? If we pursue this strategy, what are we deciding not to do? What specific capabilities will we need to develop in order for this plan to succeed? What are we doing that’s unique? Adds value for the customer? Are there other opportunities that are better? Where can we go wrong? What else, What are we missing? The Leader’s focus on continuously probing for additional information and keeping an attentive eye on the changing environment assists the team in numerous ways. Perhaps most importantly, by providing an environment of positive questioning, a culture where everyone on the team feels it is safe to bring up contingencies is created. And in doing so, the Leader has created a safe place for everyone in the organization to practice personal accountability and to make better choices, individually and collectively. That, simply, is QBQ. 1″QBQ! The Question Behind the Question, What to Really Ask Yourself to Eliminate Blame, Complaining, and Procrastination”, John G. Miller, Penguin Group, 2001, 2012.